More and more people were gathering around the Heavenhawk Island, and most of them were just here to spectate. From time to time, more geniuses from the Asura Palace would arrive, joining Li Hao and Xiu Rui’s group. Jiang Chen narrowed his eyes while keeping his mouth shut. He was pondering about the Heavenhawk Island Master’s plot. Suddenly, Jiang Chen’s eyes lit up as he recalled the conversation between Li Hao and Xiu Rui just now. This formation couldn’t be destroyed with only a few men. Li Hao and Xiu Rui were waiting for the other geniuses of the Asura Palace to arrive, so that they can launch a combined attack. Rope in all of the enemies and eliminate them with one stroke. That’s right, this was most likely the Heavenhawk Island Master’s true purpose. The solution Li Hao and the others had come up with was exactly what the Heavenhawk Island Master wanted, this was the only reasonable explanation. If not, it would be unnecessary for the Island Master to put up this formation. He was only using this formation to temporarily halt them, and wait until all the geniuses of the Asura Palace arrives; only then would he launch a surprise attack. If Jiang Chen was right, once all the men of the Asura Palace arrived, without them even having to attack the formation, it would break by itself. At that point of time, all the mighty warriors hiding in the Heavenhawk Island would storm out and eliminate all geniuses of the Asura Palace in one swoop. Jiang Chen had to admit that the Heavenhawk Island Master’s approach was very vicious. However, there was still one thing Jiang Chen couldn’t understand. What kind of hatred did this Heavenhawk Island Master have toward the Asura Palace? Why did he want to kill all their geniuses in one go? Although the pirates of the Chaotic Ocean were considered villains, it didn’t mean that they would toy with their own lives. Under normal circ.u.mstances, when facing a major power like the Asura Palace, none of them would needlessly risk provoking them. It was logical that the Heavenhawk Island Master killed the 13th Tyc.o.o.n because of a conflict, but when faced with this large group of geniuses who all wanted to kill him, not only did he not run away for his life, he actually set up a crafty trap. Didn’t he know that the Asura Palace would unleash their fury upon him if he really killed all these geniuses? The answer was an obvious no. Unless the Heavenhawk Island Master was an idiot, there must be a reason behind it. Jiang Chen slightly tilted his head upwards, quietly staring at the Heavenhawk Island, awaiting any sudden changes. A newly arrived genius of the Asura Palace coldly harrumphed, portraying an incredibly arrogant att.i.tude. More people gathered around to watch, and more geniuses from the Asura Palace arrived as well. One hour later, thirteen geniuses from the Asura Palace had arrived, and including Tan Lang, there were fourteen of them. Tan Lang took a step forward. He had to stand out at this moment, because if he didn’t provide his strength, it was equal to him giving up the chance to fight to become the 13th Tyc.o.o.n. Also, after this matter was resolved, all these senior disciples of his would definitely hara.s.s him. Big Yellow was very eager to stir things up. Huo Wei asked. 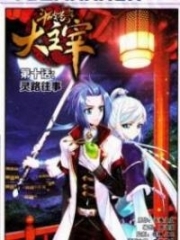 He, Chang Qing and the female disciple felt that they were completely useless here in the Chaotic Ocean. Jiang Chen gave them a friendly reminder. He knew something fishy was going on today, and with the trio’s strength, joining the battle was no different from committing suicide. Within a battlefield full of Combat Kings, any existence below that realm would most likely die. The trio looked at each other for a brief moment before finally nodding their heads. They felt that Jiang Chen’s words were correct, and they were well aware of their own strength. Thus, the trio turned around and left the battlefield. Xiu Rui shouted at the group. However, a scene that brought great shock to everyone was revealed. Before the group could even attack, the crystal-like shield just disappeared without a trace. The formation that protected the Heavenhawk Island had vanished, as if it had never been there before. The group cried out in shock. They weren’t alone, even all the spectators were surprised by this. No one had any idea what the Heavenhawk Island was up to, as they actually removed their defensive formation at this most critical moment. Could it be that the Heavenhawk Island Master knew he couldn’t escape from death, so he gave up on defending? No one had any clues, but one man was able to maintain the same calm expression; Jiang Chen. The situation had proven his guess. Up next, the real show was going to be revealed. Li Hao laughed out as he shouted toward the Heavenhawk Island. His voice was like a sudden clap of thunder, and it echoed throughout the entire sky above the island, making sure that everyone could hear him, loud and clear. An extremely sharp voice rung through the air. In the following second, a black figure shot out from the Heavenhawk Island like a sudden clap of thunder. It was a middle-aged man with a skinny body, a long hawk-like nose, and a pair of black wings behind his back. He was none other than the Heavenhawk Island Master. While looking ahead with his sharp eyes, Jiang Chen was surprised by what he saw. The original form of the Island Master was that of a rare Combat Hawk. However, Jiang Chen could actually sense an indistinct human aura from its body. This was truly abnormal. Not only this, Jiang Chen could also see the real cultivation of this Combat Hawk. It was actually a Second Grade Demon King. Although he was hiding his real cultivation, suppressing it down to the peak First Grade Demon King realm, he couldn’t hide it from Jiang Chen. No wonder this Island Master was capable of killing the 13th Tyc.o.o.n. Before he could think about this matter any further, another five powerful auras emerged from the Heavenhawk Island. In the blink of an eye, they all appeared in the sky and hovered in different places. Each of these five men were emitting powerful auras. Among them there was a muscular man who was a Second Grade Combat King. His overall strength was much greater than that of the others in the group. Tan Lang was the first man to react. He recognized these six men in front of him. They were the infamous Pirate Lords of the Chaotic Ocean! Out of the Seven Pirate Lords, aside from the mysterious number one pirate, all the other six were here. It was said that the relationship between these seven pirates was not harmonious, and that they were frequently fighting amongst each other. However, today they had actually grouped together. Judging from the situation, it seemed like they had teamed up in order to deal with the geniuses of the Asura Palace. This was a really unexpected scene for everyone. You're Read Dragon-Marked War God Chapter 494 online at NovelOnlineFull.com. You can use the follow function to bookmark your favorite novel ( Only for registered users ). If you find any errors ( can't read,broken links, can't load photos, etc.. ), Please let us know so we can fix it as soon as possible. And when you start a conversation or debate about a certain topic with other people, please do not offend them just because you don't like their opinions. You're reading Dragon-Marked War God. This manga has been translated by Updating. Author(s): Su Yue Xi. Already has 14323 views. Current Time is 19-Apr-2019 17:03:28 PM.